Is it possible to change the integer labels on two dice [from the standard 1,2,3,4,5,6] such that the distribution of sums remains unchanged? When we do it this way, the exponents represent the label values for each face, and the coefficients represent frequencies of each label landing face up (relative to the total sample space). This is neither surprising, nor super helpful. Each "sum" occurs once out of the six possible. We knew this already. You can easily confirm that this jibes with the standard diagram. For instance the sum of 7 shows up most often (6 out of 36 times), which helps casinos make great heaps of money off of bettors on the come. Take a moment. Compare. Check out those strange and beautiful labels! We can mark up the first die with the exponents from the u = 0 case, and the second die with the u = 2 case. When we multiply those two polynomials together we get back P(x)2, which is precisely what we needed (check if you like)! Our other option, of course, is to label two dice with the u =1 case, which corresponds to a standard die. And, thanks to unique factorization, we can be sure that there are no other cases. Not only have we found some different labels, we've found all of them! If the a's on the first die are (1,2,2,3,3,4), then the b's end up being (1,3,4,5,6,8), and vice versa. And, comfortingly, if the a's on the first die are (1,2,3,4,5,6), then so are the b's on the second one. Two dice with the u = 1 label are what you find at every craps table in the country. 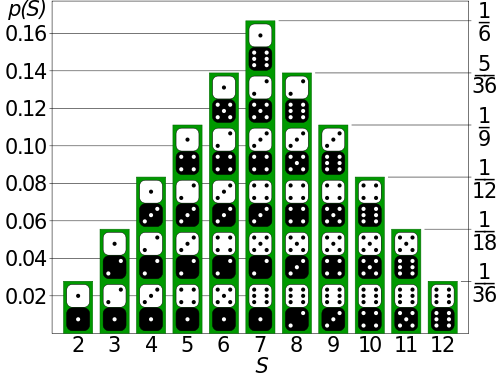 One die of each of the other labels forms a pair of Sicherman dice, and they are the only other dice that yield the same sum distribution. You could drop Sicherman dice in the middle of Vegas, and nobody would notice. At least in terms of money changing hands. The pit boss might take exception. Come to think of it, I cannot stress how important it is that you not attempt to switch out dice in Vegas. Your spine is also uniquely factorable...into irreducible vertebrae. This entry was posted in Math + Musing and tagged algebra, dice, math, probability on April 30, 2012 by Chris.